About one in eight women experience postpartum depression, and a similar proportion experience depression during pregnancy, but psychiatrists still don't know enough about what contributes to the risk. In a major new study, researchers including Dr. Katherine Sharkey will employ an iPhone app and genetic screening to amass the data needed to advance that understanding. Sharkey, an assistant professor of medicine and of psychiatry and human behavior in the Alpert Medical School of Brown University and a sleep medicine physician at University Medicine, said the idea behind the study consortium, "Postpartum Depression: Action Towards Causes and Treatment," is six years in the making. "At the 2010 Marce Society conference in Pittsburgh, a group of researchers involved in collecting genetic samples in our research participants and patients with postpartum depression met to talk about banding together so we could amass the large numbers needed to understand how genetics contribute to postpartum depression," said Sharkey, who sees patients through the University Medicine Foundation and does research at the Sleep for Science Research Laboratory and Rhode Island Hospital. "We agreed to form the PACT." Now the study, led by the University of North Carolina, has launched. Clinicians like Sharkey across the country will encourage patients to enroll by using the app, which will gather data about their experiences with pregnancy and delivery and how they are feeling. Women do not need to be in a current depression to participate, she said, because their information will be valuable if they have ever experienced postpartum depression. Some app users will be asked to volunteer to share genetic samples for analysis. In all, consortium researchers hope many thousands of women will become involved. "Once data are collected, I will participate in data analyses, interpretation of findings, writing papers with the results, and hopefully developing and implementing new prevention and treatment strategies for perinatal depression," said Sharkey, who is particularly interested in the role sleep – or a lack of it – may play in postpartum depression. The research is important, she said, because the perinatal period is a particularly vulnerable time for women. But it also goes beyond that because depression can affect everyone around a woman, as well. "We know that the children of mothers who suffer from postpartum depression also are negatively affected – they are more likely to suffer physical and emotional problems and to have trouble in school," she said. "And the most recent data examines the huge stress that postpartum depression in a new mom has on new fathers – really the whole family suffers. 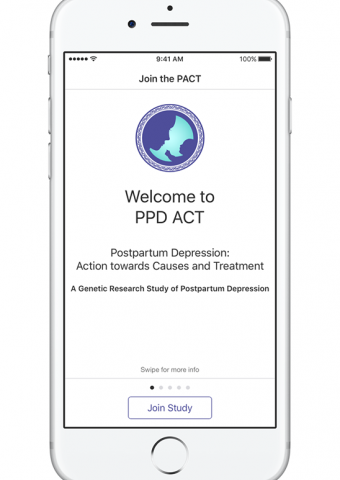 By answering a few questions in the app, women who have current or past perinatal depression could help us make progress toward treating and preventing this devastating illness."